NaNoWriMo is about to begin and I will be spending all of my spare time in the month of November writing my third novel. I plan to attend a slew of NaNoWriMo Local Events, including the write-ins. That means mobile writing. I have a work laptop, but it’s generally a bad idea to do personal work on your corporate laptop. That leaves my iPad or my smartphone. I chose to use my iPad and played with some apps and accessories to figure out the best way to do it. 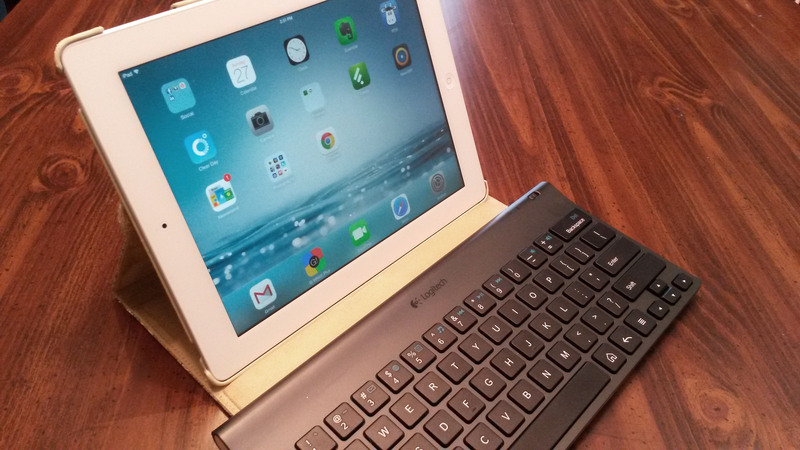 Here’s how you can use your iPad to write your NaNoWriMo novel. Syncing: You want to do some writing on your home desktop, then pick up where you left off on your iPad. You want your documents to sync. 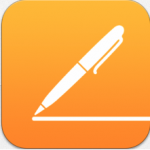 Offline Writing: You want to be able to write on your iPad even when you have no Wi-Fi available. Rich Format: You want to be able to use different fonts and styling, like Bold, Italics, Courier font, headings, and more, and you want them to sync perfectly between devices. Word Count: You have to have a word counter in your program so you can track your words for NaNoWriMo. There are lots of apps and accessories out there that could enable you to accomplish your goals. As part of my technical blog, I wrote an iPad Series of articles on what you can do with your iPad. As part of that series, I wrote an article on Work Productivity on the iPad that focused on using an office suite, creating graphics, and writing a blog. I evaluated Pages, Skydrive, Google Drive, Quick Office, Evernote, and the Chrome Browser. While prepping for NaNoWriMo, I went through all of these options again and now have a recommendation. What app should you use on your iPad? It depends on your platform. If you only work on Apple products, whether you have a Mac or you’re ONLY working on your iPad, Pages is your best bet. Pages will work flawless syncing and backups to the iCloud and will be worry-free. If you’re concerned that you’ll need to have your final edit in Microsoft Word, that’s not a problem. Just “share” your document as a Microsoft Word document and “open” it in another program – like Dropbox or Google Drive. Your iPad is an Apple product, but your desktop/laptop is running Microsoft Windows and has the Microsoft Office Suite. Your best bet is to keep your novel platform-independent until you’re ready to publish. 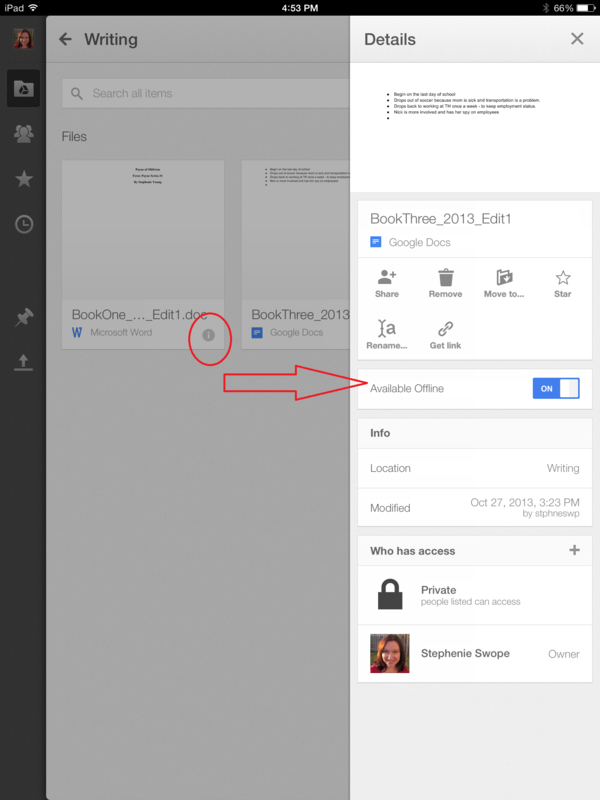 Google Drive is a combination of Google’s file sharing and syncing and the old Google Docs system. Begin writing your novel in Google Drive. The file will be saved as a .gdoc format. Microsoft uses .doc or .docx. Don’t worry. When you’re done and ready to send it off to a publisher, you can go to any browser and download it as a Word document. AutoSaves: Your novel will be automatically saved as you type. I couldn’t find any blurb where this was a selling point, but I tested it and it works! If the app crashes, just reopen it and pick up where you left off. This feature alone could potentially save your sanity and hours of rework. Offline: You can sync your document just before you leave home and work offline all day. Click on the little i on your document and turn on Available Offline. 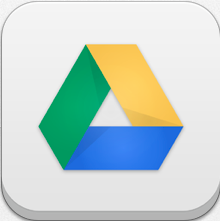 Any Computer: You can download the Google Drive syncing app for your personal computer, or just open a browser on any computer, go to drive.google.com, and sign in to your Google account. You can view and edit your document there, even if you’re on a library computer. Just don’t forget to log back out of your Google account when you’re done. If you’re writing a novel on your iPad, you really, really, really need a keyboard. Bluetooth keyboards work very well with an iPad. I am using the Logitech 920 keyboard that I originally purchased to use with my Android phone. I love the stand/case that it comes with. I haven’t had any trouble using it with my iPad. If I were buying a new keyboard today, I would still buy the same one, mainly because I love the hard case that turns into the stand. If I were looking for a more affordable option, I would get the Anker Ultra Slim Mini keyboard. It gets great reviews, is affordable, and is available in black or white. Hint: black keys look nicer longer. White gets dirty. So – get your apps, get your accessories, and get started writing!